A couple of interesting media appearances for Transform last week. The first was an invitation to debate drug legalisation/regulation with Anne Widdecombe MP on David Frost's Al Jazeera show; 'Frost over the World'. This was significant in that the show is broadcast to an audience we rarely access - 140 million households internationally (although not, presumably, anything like that many actual viewers) - mostly in the Middle East, where the drug law reform debate is historically some way behind Western Europe and the Americas. Anne Widdecombe (who was very personable and charming in the green room) is famously outspoken on the issue (she has clashed with Transform before), and one of the most public voices (along with Melanie Phillips) for a particular form of moral authoritarianism in the drugs debate, which is, IMHO, rooted in ideology rather than evidence and rational analysis. She is, however, unlike some of her political colleagues and drug war advocates, unquestionably sincere and well intentioned in her beliefs , which I can respect even if she has got it horribly wrong. Another TV appearance was on the BBC's Newsnight (Scotland), available on iplayer here for a few more days (and we will try and sort something out and post it here when iplayer has expired) . 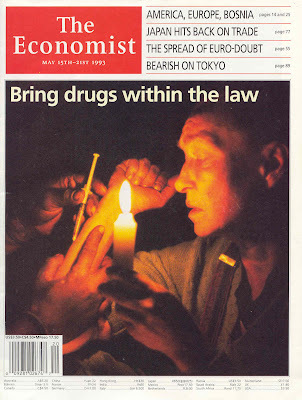 The interesting thing about this one was the the Newsnight editorial position was very much why has drug policy been so hopeless for so long, and given that it has been, why aren't politicians engaging with the legalisation/regulation debate. This sort of questioning is exactly where we need to be, and was a welcome sign of the changing climate in this debate. It was also a nice curtain raiser for next week's Transform publication of our Cost Benefit Analysis report. Dr Frederick Polak and others have been trying to get the UNODC to publish their discussion document on the Dutch coffee shop system for some time now. Here's the latest attempt to get some answers about the report. Last May at the international harm reduction conference in Barcelona, Mr. Costa had promised to publish the report “very soon” - it still hasn't been released. You can see Dr Polak's previous attempts to get Costa to respond to his questions about the paper here. This time, Mr. Costa did admit that there are some discussion papers produced by his agency that “were eventually quashed” and “remained an internal document never published”. However he claimed that he had given a detailed answer regarding the document on his website. According to economic science, the greater the availability of a commodity on the market, the more likely its consumption (via the price effect, but also thanks to psychological factors). Does this only apply to normal markets? My Office has examined whether there is a statistical relationship between availability of drugs and their use, and reached the same conclusion. This is important work, that should be informing important decisions (not least around the now completed 10 year review and political declaration), but has similarly never been published and made available for public scrutiny, even to member state Governments. 'Scientists' actually publish work, so that their statistics, methodologies and conclusions can be discussed, scrutinised and learnt from. This is the very essence of scientific and social policy discourse, something Costa parades the trappings of whilst simultaneously ignoring its most basic principles. Hopefully someone at the UNODC will see fit to release both the Netherlands study and statistical analysis on drug availability into the public domain so we can see what it reveals reveals and why the UNODC have chosen to go against there own promises and scientific (and indeed UN) principles of free debate, by suppressing the work. Hopefully member states - particularly the UNODC funders (prominently including the UK and the Netherlands) who of course fund such work in the first place - will demand that the reports are published so they can be subject to public scrutiny and contribute to public debate. This is what the rational policy development within UN forums should be all about. In today’s Prime Minister’s Questions Lembit Opik MP requested a meeting with the PM to propose a full impact assessment of current drug policy. “A new European Commission report on drugs shows that despite prohibition the illegal drugs trade has thrived, creating what the head of the UN Office on Drugs and Crime, Antonio Maria Costa, describes as a “staggering” criminal market, destabilising health policies and entire countries. 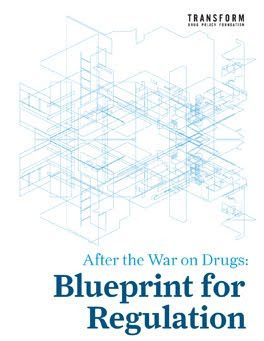 A full impact assessment laying out and counting the costs of current drugs policy in a structured and detailed way for the first time, would be a significant step towards making future policy evidence-based – and therefore more effective, just and humane. 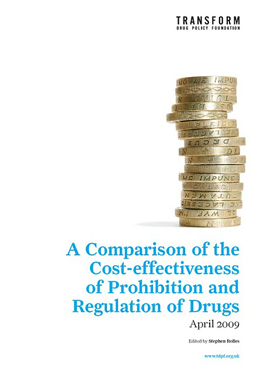 Transform has long been calling for a full Cost Benefit of Analysis (CBA), which an impact assessment would be part of, comparing current UK drug policy with alternatives. We would like the UN to orchestrate a similar initiative at the global level. At a recent All Party Parliamentary Group on the Mis-use of Drugs meeting Transform laid down a challenge to all: support this approach, or don’t pretend you are interested in having evidence-based drugs policy. We will be publishing our own UK oriented CBA soon, laying out the best evidence available, and the gaps in research that should be filled, so watch this space. Once again, absolutely terrible news from Daily Dose this week, that unless adequate sponsorship can be found by the end of the month, the peerless drug news service that has been running since 2002 will close. For any blog readers that don't know about Daily Dose, and there cant be many, it is a BRILLIANT daily drug news listing website (and free subscription email) that is hand-complied 365 days (and nights) a year. Testimony to its brilliance is that it has over 7000 subscribers and gets 800,000 hits a month. For Transform the service is invaluable. Google news alerts and similar automated news aggregators are, lets face it, a bit rubbish. They completely lack the depth, editorial input, and human touch that makes Daily Dose so incredibly useful. It is the editorial genius of Jim and the rest of the Wired Initiative team that means it outstrips any of the automated parliamentary news filter services Transform have used in the past, as well as automated news search services like Lexis Nexis - and these cost serious money, whilst Daily Dose is completely free. The great thing about the editorial content is the non-biased coverage from all news and information services across the web, reflecting the full range of media outlets and opinion in the drugs field. That's why everyone loves it and everyone uses it - from Whitehall and Government, through the treatment field, and across the non-government sector. Daily Dose is a non profit free service supported by sponsorship - which to any commercial players in the drugs field should appear to be a complete bargain given the site's amazing profile. If there is one thing Daily Dose has fallen short on, it is marketing itself - probably because they are so obsessed with turning out first class content. So to all you potential sponsors: compare the measly £5K you would have to spend to have your logo associated with the much loved and legendary Daily Dose (raking in 10 million hits a year, and a million or so emails direct to marketers-dream demographic in the drugs field) to the untold thousands you shell out on having one of those pointless fancy stalls at yet another awful drug conference where you speak to about three bored people who really just want a free pen. They may be the UNintended consequences of the drug ‘control’ system, but they show that the entire prohibitionist apparatus should come with an explicit health warning. The UN Commission on Narcotic Drugs completes its marathon session on evaluating the ‘success’ of the drug control system tomorrow, and the ‘coalition of the willing (and not so willing)’ march out of the building, not quite in lock step, but maintaining de facto support for the global war on drugs. It is timely to examine whether these ‘unintended’ consequences, can still be seen as 'unanticipated'. Which means that he concedes that 90% use non-problematically. This first dig at the reform movement doesn't appear until page 14! Amazingly, despite his realistic analysis, he still repeats the drug free world nonsense again. Oh dear, a pointless debate… maybe he should take a look at our extensive archive of those calling for change in our voices for reform. Clearly the aim is to inure the UNODC against charges of complacency by recognising that there are negative consequences of global prohibition, and absolving themselves of responsibility by labelling them as ‘unintended’. At the same time, it attempts to undermine claims by Transform and others in the reform movement (we are as pro-drug, as UNODC is pro-mafia) that these consequences call into question the entire apparatus of global prohibition. The identification of harms caused by global prohibition is nothing new. A devastating critique was published by the UK Prime Minister’s Strategy Unit in 2003 (eventually leaked in full to the media in 2005). However, the March 2008 paper was the first real admission from the UN that there were huge unintended consequences. The use of the term 'unintended consequences' is very similar to the phrase ‘collateral damage’, used in military situations as a euphemism for dead and injured civilians. What we are talking about here are drug war casualties. It is unquestionable that these consequences are both undesirable and unintended by UNODC. No UN bodies want to enrich the Mafia, for example. However, should they have been unanticipated, given what we knew about alcohol Prohibition? It is also interesting to compare this with the way that doctors describe ‘Side Effects’ of drugs – effects from treatments that are unwanted, and have a negative effect on patients’ health. The issue of side effects from medical treatments is dealt with in a very different way than Mr Costa deals with the unintended consequences he identifies. Side effects are a significant issue of discussion between patient and doctor as part of a comprehensive exploration of a treatment package. What takes place is effectively a cost-benefit analysis of a particular intervention or series of interventions. As result of the knowledge of side effects, all treatments carry a health warning. I don’t remember seeing one of those on the UN Conventions. In the UK we operate the Yellow Card system whereby doctors, and importantly patients and carers, can report negative effects to a body of oversight. Genuine civil society involvement in global drug policy development, anyone? How about reporting unintended consequences as part of the feedback of member states to the annual UN World Drug Report? What doctor would prescribe a one-size fits-all treatment for so many countries for whom prohibition is contra-indicated – Dr Costa of course and his prohibition-friendly group of world leaders. What are the indications that the regime’s side effects are outweighing the benefits? One of the key issues here is that of critical self-evaluation. In order to move beyond the current impasse in drug prohibition, key UN member states (E.g. G20 countries) and the UN bodies that oversee prohibition, must make the entire edifice subject to normative examination, including a full and frank articulation of the costs as well as benefits of the regime. If the UN drug agencies cannot collectively admit that a war on drugs is a singularly inappropriate treatment regime for us all, then we will need to find another forum to develop global drug policy that is effective, just and humane. This short flim produced by the HCLU in conjunction with uber-blog Boing Boing provides commentary from various figures in the drug policy reform movement on the current events at the UN in Vienna where the Commission on Narcotic Drugs is meeting to determine global drug strategy for the next ten years. (Danny from Transform appears in the film). Today Ministers from around the world are in Vienna for the High Level Meeting of the UN Commission on Narcotic Drugs to set a new ten-year UN drug strategy. Whilst fear and inertia has generally prevailed amongst our political leaders, we have also heard a huge range of serious voices calling for a debate on replacing drugs prohibition with legal regulation and control. At the same time a concerted effort has been made by Antonio Maria Costa the executive director of the UN Office on Drugs and Crime (UNODC), to smear those calling for reform as “pro-drug”. The effect has been to stifle critics of the status quo, and make a rational and mature exploration of alternative approaches into a political no-go area, by inaccurately and offensively portraying advocates of change as ‘pro-drug’. In a recent paper the head of the UNODC admitted that the drug control system had a "dramatic unintended consequence: a criminal market of staggering proportions". Costa added: "The crime and corruption associated with the drug trade are providing strong evidence to a vocal minority of pro-drug lobbyists to argue that the cure is worse than the disease, and that drug legalisation is the solution." This was the latest in a series of similar public comments over several years seemingly based on the absurd false binary that since Costa views his position as ‘anti-drug’ then anyone who disagrees with him must be ‘pro-drug’. However, despite his attempts to malign those calling for debate, many have had the courage to call for reform. So who should be included under Costa’s ‘pro-drug’ banner? "We can bring peace and stability to producer and transit countries, and end much of the harm in consumer countries only by ending the war on drugs and replacing it with an effective, just and humane system of regulation and control. For that to happen, world leaders must stop using the UN to shut down any real debate on alternatives to war, and listen to the voices from across the political spectrum calling for change." 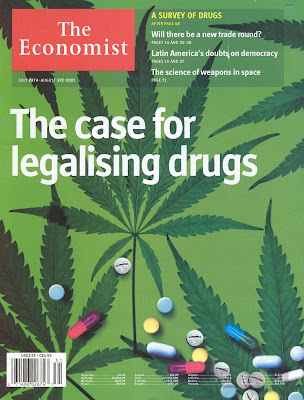 The Economist this week runs one of its cover-story drug policy and law reform special issues. This latest installment, that follows previous efforts in 1993 and 2001 features the cover below , four detailed briefings and leader column. The Economist has a readership of 1.2 million (half of them in the US) is highly influential and widely read by a demographic with a serious interest in economics - from all political persuasions, despite its generally right leaning economic perspective. This latest installment comes at a timely moment; coinciding with the 100 year anniversary of the Shanghai opium convention that signaled the dawn of the prohibitionist drug control paradigm, and the UN High Level Segment in Vienna where it is all beginning to unravel. "Next week ministers from around the world gather in Vienna to set international drug policy for the next decade. Like first-world-war generals, many will claim that all that is needed is more of the same. In fact the war on drugs has been a disaster, creating failed states in the developing world even as addiction has flourished in the rich world. By any sensible measure, this 100-year struggle has been illiberal, murderous and pointless. 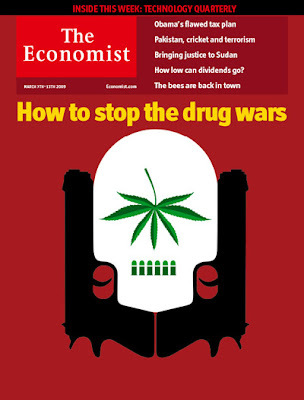 That is why The Economist continues to believe that the least bad policy is to legalise drugs." This latest failure of leadership at the Commission highlights how the entire UN drug control infrastructure is not fit for purpose and should be completely over-hauled. The 52 session of the CND will be meeting in Vienna. First the government ministerial High Level Segment (11th –12th March 2009) will sign off the Political Declaration, and then the CND meeting itself (16th-20th March 2009) will debate the details. The global market in illegal drugs is estimated at £160 billion a year. If the current regime remains in place for the next decade, the total could approach £2 trillion. The crime costs accrued over the last ten years in the UK alone, are estimated to be in the region of £100 billion.